The first year of this programme (2009) was spent following the processes in situ and included facilitating local community representatives’ attendance at the inter-sessional UNFCCC meeting in Bangkok, in September–October 2009. In 2010 we focused on sharing these international experiences with communities and regional CSOs in Indonesia. The first two opportunities to discuss climate justice concerns with communities were in Aceh. In May 2010, DTE organized a training of trainers workshop on climate change for members of JKMA, Aceh’s Indigenous Peoples Network. Pang Yuriun, the then JKMA Coordinator, who came with DTE to Bangkok, felt that climate change is a complex issue that needs to be understood by communities if they want to play a more active role in climate change policy discussions and negotiations. This is particularly relevant for communities in Aceh, since their region has been at the forefront of climate change-initiatives such as REDD. The training session was attended by 22 JKMA members from all over Aceh and some partner organisations. Both genders were represented equally. Understandably, REDD was a hot topic during the training session. Picking up on some of the main arguments in the REDD debate, the majority of participants agreed that despite its promise of contributing to emissions reductions, REDD is an exclusive and top-down initiative. It is almost unheard of by the communities themselves whose livelihoods will be most affected by REDD schemes. The general feeling was that communities have to bear the consequences of living in designated REDD areas with all the accompanying restrictions on access to forest resources, while the ‘big players’ such as the logging companies that have contributed significantly to the loss of carbon by clearing the forests, get away without any obligation to rectify the damage. The impact of ecological destruction on local community livelihoods - whether due to climate change, or mal-development, together with the underlying problem of the lack of recognition for people’s rights - was a major impetus behind the founding of JKMA. So it is not surprising that the organisation is expecting to replicate the training among their wider membership. As in many parts of Indonesia, the experience of the Suharto era, when resources-rich regions were exploited by a few powerful business players holding licenses from Jakarta, still haunts the people of Aceh. Despite the decentralisation of political power from Jakarta to Banda Aceh, the fact that the communities are the last in line to get information, let alone be consulted about such initiatives, shows that in this respect at least, not much has changed. Strengthening customary institutions, especially mukim. The Aceh Governance Law explicitly gives room for customary institutions to exist, but the government doesn’t fully support mukim as a ‘federation’ of gampongs. Customary institutions need strengthening to support mukim leadership, to achieve good governance and so that mukim leaders become good facilitators between people and government. Political education and awareness-raising in natural resources management particularly on the issue of climate change and related issues. Tenure and capacity to manage natural resources must be encouraged through various political agendas and other means with the aim of ensuring that the indigenous communities secure recognition for their ownership of the natural resources. Economic development toward indigenous peoples’ self-sufficiency. Indigenous communities are disadvantaged under the prevailing free market system. Therefore it is important to prepare indigenous peoples to anticipate tough competition and to avoid the poverty trap. Education and awareness-raising about local knowledge/wisdom. People have been living in harmony with nature in their ecosystems, guided by customary wisdom and local knowledge. Along with the introduction of pro-growth development model has come threats to the customary way of life from outside competition. Institutional strengthening especially for JKMA members. Although some districts have passed qanun (local laws) on the governance of mukim customary areas (including the roles and responsibilities of mukim leaders), there is no special qanun on REDD. Another problem is the language that is used in the information available to communities. Many documents exist only in English, which itself defies the intention, if indeed there is any, to disseminate information. It should be stressed that the people of Aceh, are not against initiatives to tackle climate change. The problems related to climate change and environmental degradation are very real for them, as was evident in the workshop discussions. They face crop failures and reduced harvests due to the changing and unreliable seasons, attributable to climate change. For indigenous communities in Aceh, the idea of building initiatives upon uncertain ground involving the lack of recognition of their rights to access resources is disturbing. Even without REDD their livelihoods are already threatened by land grabbing. “…We have been displaced by HTI projects, and had a similar experience when they decided to establish the Leuser protected area. We cannot access our gardens after they were mistakenly claimed as part of the protected area. Now REDD is coming, what is going to happen?...” said one workshop participant. Upon receiving the demands from the mukim to re-establish mukim rights to manage their resources, the provincial government responded by asking them instead to “…support national projects”. During the workshop, there was also self-criticism by mukim leaderswho do not know the history of their territories, which makes it difficult to assert the boundaries of their areas. Traditionally, a mukim leader’s role is greater than just administrative responsibility. He also holds moral responsibilities, for example, by ensuring no poverty exists under his administration, by encouraging people to work and by asking the better off to support the less well off. Confusion over land use and carbon is also prominent. While the Aceh provincial government is offering the region as a designated REDD area, the conversion of forest for oil palm plantations has continued unabated, as in the case of Aceh Jaya district, where oil palm and REDD development is most intensive. One initiative is supposed to mitigate emission while the other releases more carbon into the atmosphere by clearing forests – so where is the carbon saving? REDD has also prompted questions about regional autonomy – and in Aceh’s case, special autonomy, where decision-making about, and benefits from, a region’s resources are supposed to be devolved to regional governments. Hundreds of companies have been issued licences by Jakarta for resource projects in Aceh and many of them are now interested in REDD. Yet none has an office in Aceh itself. re-establish mukim rights by recognising indigenous peoples’ rights (through regulations that are pro-people and that recognise the diverse purposes of forests under customary forest law). establish clear mukim boundaries (the Aceh government is planning to demarcate mukim boundaries). everybody should fulfil their responsibility to tackle climate change. ensure transparency at all levels (local, regional, national, international). uphold the principle of justice – industrial countries shouldn’t only reap the benefits while taking less responsibility. In January 1999, representatives of indigenous peoples from 50 gampong in Aceh agreed to combine efforts to fight for recognition of their rights to resources and their own political systems under the umbrella of JKMA - Aceh’s Indigenous Peoples’ Network. At that time, the province was called ‘Daerah Istimewa Aceh’ or the Special Territory of Aceh, a legacy of its support – financially and politically – for the fledgling Indonesian state in the immediate post-independence period of the 1950s. Aceh is rich in natural resources and generates most of its income from the oil, gas and mining sector, followed by agriculture and fisheries. The region has had a troubled past. For almost 30 years starting in the 1970s, the region was a conflict zone, between an armed independence movement led by the Free Aceh Movement and the Indonesian military. The conflict cost many lives and led to the region being isolated due to its status as a conflict zone. One main spur for the independence movement was the exploitation of Aceh’s natural resources by the Jakarta-centred regime. The forced appropriation or grabbing of resources from the local communities was the typical modus operandi of Suharto’s regime. This, combined with the new opportunities for civil society to speak out in the period of political reform known as ‘reformasi’ that followed Suharto’s fall from power in 1998, gave impetus to the establishment of JKMA. 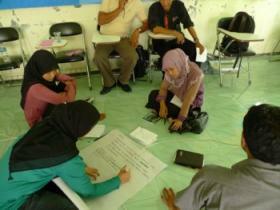 In July 2010 a further opportunity arose for DTE to share experiences of climate justice work with other CSOs in Aceh. This time a 3-day workshop was co-organised with Lamjabat, an environmental organisation located on the outskirts of Banda Aceh. The title, ‘Climate Change and Livelihoods’ was selected to explore the need to strengthen sustainable livelihoods to respond to the impacts of climate change. The workshop was well attended by around 30 people, including 5 officials from the local environmental agency and sub-district administration, NGO workers and two NGO activists from Timor Leste (East Timor). Participants shared their observations that in the last 10 years seasons have become more unpredictable with a higher incidence of turbulent weather, including sudden high winds, and typhoons. In food production, they also noted a higher incidence of crop pests leading to failed harvests, and changes in agricultural cycles and practices due to the changing weather patterns. A greater incidence of health problems was reported, including new kinds of illnesses (eg flu), while people’s immune systems are being weakened due to more widespread pollution and contamination. Vector-borne diseases like malaria have become more common along with the temperature increases that provide fertile ground for mosquitoes to breed. Rising temperatures also contribute to coral bleaching, as observed by Lamjabat staff and their NGOs colleagues working on marine issues. Furthermore, changing wind patterns due to the changing weather are affecting fishing and fisherfolk’s livelihoods. On top of the effects of climate change, natural resources remain under pressure from destructive logging. Aceh’s once vast forests continue to attract loggers whose reckless practices are reducing water levels in the region, among other damaging impacts. The local environmental agency has recorded the disappearance of 9 rivers in Aceh within the last decade. Where those rivers used to flow, there are now either houses or roads. More rivers are expected to disappear in the near future according to a government official participating at the workshop. He observed that biodiversity, too, cannot escape the damage and some species have become rare, if not extinct. One of the instant effects of climate change is the impact on people’s earnings. Disruption to fishing patterns automatically affects the income of fishing communities. Coral bleaching caused by sea warming and other destructive factors means reduced fish stocks too. The question then is, what alternative livelihoods are there for them? Some of the organisations who participated in the workshop are working with communities to explore potential solutions. One approach to the problem is to mitigate further destruction, for example, by raising awareness through environmental education. Lamjabat, founded by people concerned about marine ecology and the contribution it makes to sustainable livelihoods, is helping to safeguard the nearby coral reefs which are showing some signs of dying. They have started a campaign to stop the use of explosives to catch fish on the reef practiced by some local fisherfolk, by raising awareness of the importance of coral reefs in sustaining fish stocks. They are also trying to show the link between logging and healthy seawater. Located by the coast and at the foot of a mountain, Lamjabat can easily point to evidence of destructive logging which has triggered erosion, sent soil into the sea and choked the coral. It follows that the work on protecting marine life is closely connected to the work to protect forests. There was some discussion during the workshop of activities which are exploring alternative or more sustainable resource use, such as encouraging communities to plant ‘productive’ plants like nutmeg, cocoa, mango and other fruit trees to provide an incentive not to clear the forests. There is also initiative to link micro-credit with replanting programs, where credit will only be given if you plant trees. Mukim - the Acehnese customary legal unit of governance between gampong (lowest level of customary governance) and sub-district. A mukim usually covers several gampongs. HTI: large-scale timber plantations, aimed at supplying the pulp industry and other wood-based industries. See articles about Leuser in previous DTE newsetters, eg DTE 55, November 2002, Aceh pushes Leuser Road Plan’. This was voiced by and about the younger mukim leaders, who have taken the place of the elders killed in tsunami. For more information about JKMA see DTE 84, March 2010, ‘Saving the planet is our joint responsibility’.